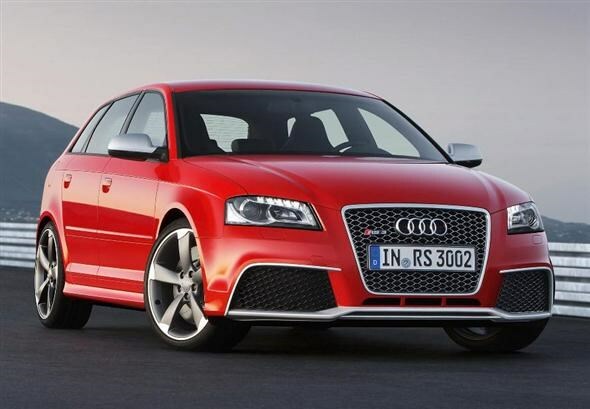 Audi has unveiled its new RS 3 model, the first time an RS version will be included in the mid-size compact model range. The new car will be available to order in December in time for first deliveries in the UK in April. It will have a five-cylinder 2.5-litre turbo-charged petrol engine which develops 337bhp with 450Nm of torque. 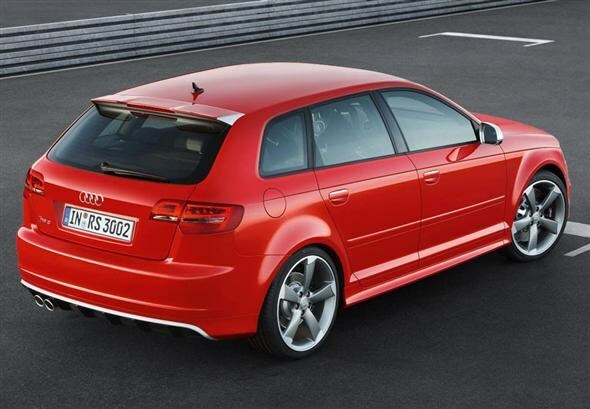 Essentially, it's no-holds-barred version of the popular five-door Sportback version of the A3. The engine will be mated to a standard seven-speed S tronic twin-clutch transmission and Quattro all-wheel-drive. Audi has also gone to the trouble of fitting a sound flap to intensify the exhaust sound. This brutal combination of power and traction means that the RS 3 accelerates to 60mph faster than a Ford Focus RS500, a Nissan 370Z or an Aston Martin Vantage. It even accelerates to 60mph almost as quickly as a BMW M5. Maximum torque is delivered between 1,600rpm and 5,300rpm and as such this new hairy chested hatch will get from 0-62mph sprint in 4.6 seconds and then go up to an electronically governed 155mph top speed. Combined fuel consumption is 31mpg, which has been achieved through weight-saving measures and brake energy regeneration. Audi has used carbon fibre-reinforced plastic (CFRP) for the front wings to get the RS 3 down to 1,575kg in order to achieve a relatively low CO2 emissions rating of 212g/km. It has suitably muscular looks, the front end featuring a deeper front apron with enlarged air intakes, an anthracite coloured single-frame grille, diamond-patterned styling and xenon headlamps. Flared wheelarches, 19-inch alloy wheels, prominent sill panels, mirror casings in matt aluminium look and a large roof spoiler as well as a high-gloss black diffuser insert and two elliptical exhaust tailpipes complete the high performance look. Inside the sports seats are upholstered in Nappa leather, with silver contrasting stitching, and the interior inlays are finished in piano black or aluminium. A flat-bottomed RS steering wheel and an exclusive design for the instruments and S tronic selector lever have been added as well as a specially configured Driver's Information System which displays boost pressure and oil temperature and doubles as a lap timer. Equipment includes a Sport button, acoustic rear parking sensors, electronic climate control, DVD-based satellite navigation with MMI (Multi Media Interface) functionality and xenon headlights with LED daytime running lights. Optional features include front bucket seats, roof rails in matt aluminium look and styling packages with black or matt aluminium details. Five exterior colours are available, plus an unlimited selection of custom paint finishes.